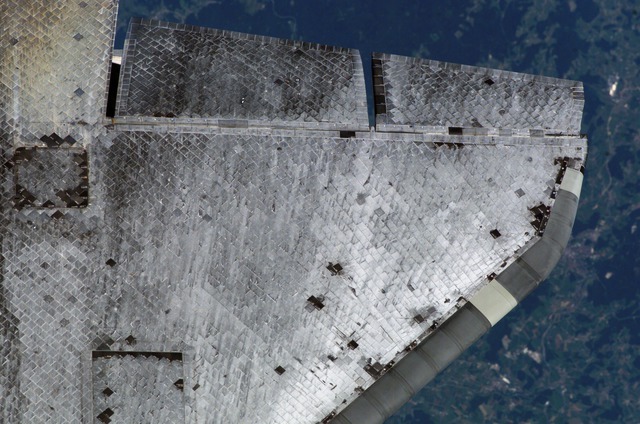 NASA and its contractors made a database to track each insulating tile on the Orbiters. No one seems to know where the records went. Let’s find them and put them online! If you have clues, please get in touch with me at @vruba on Twitter or by e-mail at celoyd@gmail.com. Update, 2018-10-17: This site was mentioned on the delightful Space Above Us podcast! The extra attention is very much appreciated. Since the last update, to be honest, all my leads had dried up. If you came here from The Space Above Us (or anywhere else, for that matter), I hope this site shakes some memories loose. Update, 2015-10-10: A trickle of excellent new tips is still coming in, including treats like screenshots of MIDIgap. Some of it has been given to me in confidence, but I hope it may be possible at least to assemble the public information into a timeline, to help understand which resources might exist and under which authorities. Update, 2015-07-08: I’ve had some great tips in the last few days. The most substantial points: that the tile identification software (at least in the 2000s) was called MIDIgap, that at least one version of the database is held by Boeing, and that several people who worked on it believe that it’s encumbered by ITAR. Well-meaning people have mentioned ITAR as a dealbreaker, but I’m not too worried. The records will find some legitimate way into the public, even if it takes a long time. Much of the database could be derived (tediously) from public domain photographs already released by NASA. Things like aerogel manufacturing techniques might possibly still involve legitimate secrets, but the records of when the tiles were glued onto the Orbiters are patently of no future competitive value, public or private. I trust that in time, this situation will come to the attention of people with the power to brush aside red tape, and they will do so. That is, if ITAR truly applies at all. Two people familiar with the matter have told me that it did apply in situations that they saw, but I’m not going to assume that it applies in this situation unless a qualified official tells me so specifically and on the record. Even if so, I’ll simply pursue an exemption under 22 CFR 125.4(b)(13) or similar. Meanwhile we can look for other, less encumbered versions of the records that might be ITAR-clean through redaction, donation to a museum, etc. In other words, while I take ITAR seriously, the idea that the records may be ITAR-controlled is at worst a “curves ahead” sign, by no means a stop sign. This is only a start! Further tips are very much welcome. “External finish/external insulation” from the Shuttle Operational Data Book , 1995. Orbiter Discovery in VAB, KSC. Photo: Jet Lowe (not dated). LOC HAER TX-116-A-12. Inspection photo of Discovery (STS-114) from ISS, 2005. NASA ISS011-E-11078. 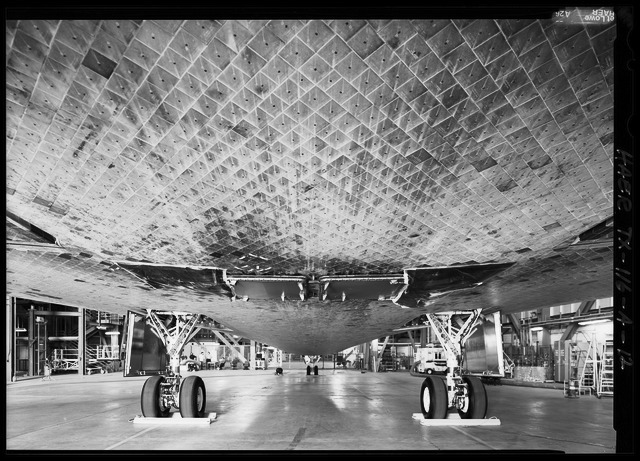 Each of the Space Shuttles carried tens of thousands of paving-stone–sized ceramic tiles. 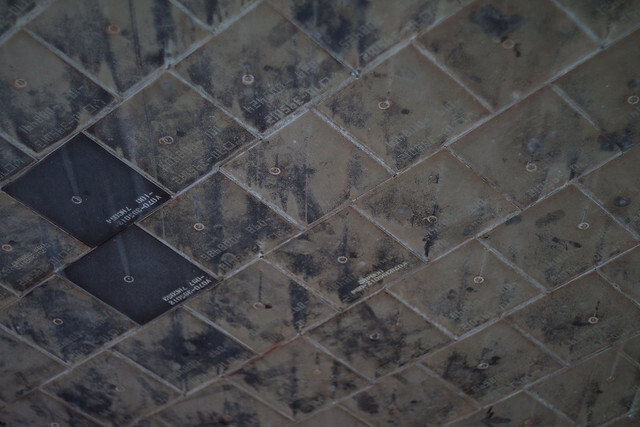 The tiles insulated the spacecraft from the heat of re-entry through the atmosphere. The idea of the Space Shuttle was that it would be re-usable, yet big enough to carry a separate satellite. The tiles were key, because they could protect a large area and be replaced individually as needed. They were made from ceramics that were highly advanced for their time. Refining and installing the tiles was unexpectedly difficult, and caused early time and budget overruns. I don’t know what form the database takes. Most likely, as far as I’ve inferred, it’s a large collection of paper records recounting how each tile was installed and its state after each flight, probably with sketches or photographs. This is just a best guess. The team is developing an automated work authorization document system (AWADS) that will enable the technicians to document the condition of each tile, determine any necessary repairs or replacement, and generate work instructions. With the automated system, the computer, which is programmed to recognize each technician’s voice, prompts the technician to find the correct tile, enter its number, and report on its condition in a systematic way. The TPS quality control technician first inspects the tiles after each flight and enters the part number, location, and condition of each tile into a computer database by voice. The computer’s central database automatically generates a problem reportin[g] electronic format, which a TPS engineer uses to identify and recommend proper repair procedures for the tile. The problem report proceeds through an electronic signature loop until final approval for the repair. Finally, the TPS technician uses the voice data entry method to indicate tile status as repair procedures are completed. No primary source that I’ve seen positively and specifically describes a database. However, taking the circumstantial evidence together, and considering NASA’s culture and the nature of the problem that it faced and solved, I confidently assume that there was indeed a database of some kind. It may be on paper, or split between different generations of the Thermal Protection System, or otherwise less than ideal. But I believe it exists. Large-scale, highly automated manufacturing is a definitive part of material culture in the rich world today. It produces our inexpensive but reliable machines and electronics. An integral part of many of these manufacturing systems is component tracking: the ability to know the history of a given object over its entire lifetime. For example, a washing machine manufacturer might be able to take an apparently unremarkable series of maintenance reports and correlate them to learn that a specific CNC unit is subtly malfunctioning when it machines a certain type of gear. QR codes and RFID are two familiar technologies that came into everyday life from manufacturing logistics. The Shuttle tile database was one of the first of these systems that have since become integral – though usually invisible – parts of contemporary life. That alone makes it historically important. It’s also valuable as a way to illuminate the labor, engineering, and political conditions in which it grew. The Space Shuttle program was weird. It balanced many technical shortcomings against broad public affection; it was both military and civilian; it was a swan and a flying brick. It was designed in the 1970s and flew into the 2010s. Its awkward, accident-prone, and unusual but effective tiles are one good way to begin understanding the Shuttle program and the contexts that it tied together. It’s fitting that the surviving Orbiters are on display in museums where ordinary people can wander up and marvel that these spaceships are covered in writing. My goal is to understand that writing better. 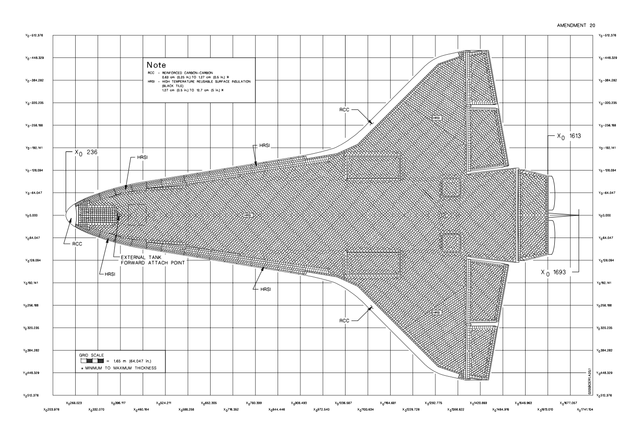 I hope that ordinary people with newer database tools – and visualization techniques – can use the tile data to tell new stories about the Space Shuttle program, where it came from, and what it meant. I’ve sent word out through several channels to find people who might know something about the database. I also cold-mailed Boeing’s public archivist, and talked with the Corning Museum of Glass (because the tiles are ceramic), among other institutions. Everyone I spoke with was generous with their time but had little concrete information. I seek the lifetime component records for all individual thermal tiles (HRSI, LRSI, TUFI) that reached orbit on STS Orbiters. These records would include manufacturing date, all inspection events, etc. Records relating to either (A) other parts of TPS (for example, gap fillers, RCC, and FRSI) or (B) each tile's current disposition (for example, whether it was donated as part of an Orbiter) are desired but not required by this request. Please do not include them if doing so would significantly increase processing time or cost, but do inform me that they exist. In short, the data I’m looking for would be sufficient to create a timeline of all recorded events in each operational tile's life from initial manufacture through decommissioning, and to exactly locate its position on the Orbiter body. I understand that the data may not be in a standard database format. As much as possible, I would like it delivered in machine-readable form (for example, as formatted text files, not as scans of printed pages). If it's in a specialized database format, please supply any available guidance on parsing it with standard Unix tools. If you have any questions about preferred formats for delivery, please get in touch. We have been informed that as part of the Shuttle closeout, Shuttle records, exceeding 80,000 boxes of data, were retired and archived at the Federal Records Center in Ft. Worth, TX. While it is possible that a manual search could be conducted for a specific Shuttle record if you were able to identify one using Category I and II criteria, a manual search for that record, which would not be a non-random, reasonable search. Please be advised that it is expected that a manual search would result in excessive direct charges. You may be interested in visiting the NASA Artifact Opportunities website since it provides some information on Tile Serial Numbers and placement on the orbiter. You may access the website at: http://artifacts.nasa.gov/tile_serial_numbers.htm. This is a fair response. NASA is right that my request was basically “Hey, tell me about…”, not “Please give me record XYZ-123.” They are not librarians; they have no duty to help me find what I want as well as giving it to me. So now I’m looking for people who can help me find it. I want to know enough about the tile records to FOIA them specifically. Or, of course, some other way in. Did someone you know work on the Shuttle tiles? Or on something related? Or in the same building? Ask them for more information! Do you have old NASA books? Or are you really, really good at web searching? See what you can dig up! Do you know someone who might know something at an air and space museum? Or a materials science department? Did your old databases professor once mention something about a Space Shuttle? Get in touch! Please do not swamp NASA (or their contractors) with rude, burdensome, or poorly constructed requests, via FOIA or other channels. We’re all on the same team here: against forgetting, not against the institutions that might remember. I don’t own the idea of trying to make the Shuttle tile records public. I encourage you to search on your own. But I am very interested, and eager to spend more time and effort. I’m running Twitter ads for this, and I would contribute resources to digitizing and hosting the database if necessary. With any information or advice you want to share, get in touch with me at @vruba on Twitter or by e-mail at celoyd@gmail.com. No. I don’t think that the tile database not public for any less than honorable reason, or that there’s anything at all shady in it. In particular, I don’t expect anything in the database to contradict the consensus accounts of the Shuttle disasters. I bring this up because people in public-facing jobs at big institutions, who have to deal with a lot of cranks, sometimes assume that’s why I’m asking for information. After several misunderstandings, it seems worth spelling out that I seek the database for the sake of the database, not in the service of any unusual theory. I think the database is not already public for three reasons: lack of funding (for archive/history/education work at NASA), ordinary bureaucratic inertia, and an underestimation of public interest. The first two forces are stronger than a conspiracy. I hope this project can help change the third.